With 42 extant species the Archostemata are the smallest of the currently recognised four major subgroups of Coleoptera. Representatives of Archostemata occur on all continents with the exception of Antarctica. However, the distribution is quite heterogeneous, with the east Asiatic & Australian region harbouring most species (22) and Europe having only one extant species. During the Mesozoic the group was much more diverse, which is documented by several hundred fossil species. Most of them have been found in European and Siberian fossil sites (Ponomarenko 1969). Recently, many new fossils of Cretaceous and Jurassic age have been described from Chinese localities (Tan & Ren 2009). Even the oldest known fossils of Coleoptera, like the lower Permian Tshekardocoleus magnus Rhodendorf, 1944, are extremely similar to extant Archostemata in all recognisable characters. However, Tshekardocoleus and other Permian beetles are not members of the extant Archostemata but either represent early side-branches of extant Coleoptera or are part of their stem-lineage. Members of the extant monophylum appear in the upper Permian for the first time (Ponomarenko 1969, Beutel 1997, Beutel et al. 2008). The name Archostemata was introduced by Kolbe (1908) who also established the taxon as a suborder of Coleoptera. At this time the only known family was Cupedidae. Subsequently, Forbes (1922, 1926) summarised the then known genera Cupes, Omma and Micromalthus under the name Archostemata (Atkins 1958). Today the Archostemata comprise the Cupedidae (33 species) and Ommatidae (6 species), and Micromalthus debilis LeConte, 1878, Crowsoniella relicta Pace, 1975 and probably Sikhotealinia zhiltzovae Lafer, 1996 (Atkins 1963; Lawrence & Newton 1995; Hörnschemeyer 1998; Beutel & Haas 2000; Beutel & Hörnschemeyer 2002a, Beutel et al. 2008, Hörnschemeyer 2009). The phylogenetic relationships of the latter three species are still uncertain (Hörnschemeyer 2009, Ge et al. 2010). The relationships between Archostemata and the other three groups of Coleoptera (Myxophaga, Adephaga, Polyphaga) have long been uncertain and are still under discussion to some degree (Atkins 1958, 1963, Kukalová-Peck & Lawrence 1993, Hörnschemeyer 1998, Beutel & Haas 2000, Caterino et al. 2002, Leschen & Beutel 2004, Hughes et al. 2006). Presently, a position as sistergroup of all other Coleoptera seems to be best supported (Beutel & Haas 2000, Hughes et al. 2006, Friedrich et al. 2009). 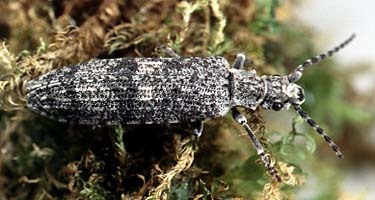 Archostemata comprise species from 1.7 mm (Crowsoniella relicta, Micromalthus debilis) to more than 20 mm (Omma stanleyi, Priacma serrata, Rhipsideigma raffrayi) body length. Characteristic features common to all these species can be found in the larval as well as the adult morphology. According to Friedrich et al. (2009) and Beutel at al. (2008) Larvae are characterized by the combination of a head with an endocarina and posteromedian emargination, mandibles with three blunt apical teeth, narrow, fused mentum and submentum, an enlarged, wedge-shaped ligula and an abdomen with tergal ampullae in the second and later instars. These characters are present in all known archostematan larvae and most likely represent autapomorphies of the group. In the adults there are some features that, in the extant fauna, are only found in Archostemata, but that probably are plesiomorphic characters that were already present in the last common ancestor of all Coleoptera. In this category fall, e.g. the typical window puncture of the elytra, which is most conspicuous in Cupedidae, as well as the venation of the archostematan hindwings and there type of folding, or more precisely, rolling of the apical part of the hindwing. Also the tuperculous structure of the cuticle and the scales that cover most or all of the cuticle in Cupedidae are characteristic but not apomorphic. The scales are also present in Ommatidae, but smaller or modified and they are missing in Micromalthus debilis and Crowsoniella relicta. Autapomorphies of adult Archostemata might be the posteriorly consticted and extended head (missing in Micromalthus), the strongly reduced anterior tentorial arms, which are missing entirely in some species, the mouthparts with an enlarged, lid-like prementum, an absent mentum and modified associated muscles as well as mesocoxal cavities that are bordered by the metepisterna and a distinct median ridge on the first ventrite of the abdomen (Friedrich et al. 2009, Beutel et al. 2008, Hörnschemeyer 2005, 2009). Phylogenetic relationships of extant and fossil genera of Archostemata and early Coleoptera were analysed by Beutel et al. (2008). Previous analyses of phylogenetic relationships of at least some of the archostematan genera include Beutel & Hörnschemeyer (2002a, b), Hörnschemeyer et al. (2002), Hörnschemeyer et al. (2006). Hörnschemeyer (2009) investigated the phylogeny of Archostemata on species level with 37 of 42 extant species taken into account. In all analyses the monophyly of Ommatidae and of Cupedidae is confirmed and the positions of Micromalthus debilis and Crowsoniella relicta are most uncertain. Originally, C. relicta was placed with Ommatidae by Crowson (1975) and M. debilis somtimes is associated with Cupedidae. More often these two small and highly modified species appear together (as sistergroups) in various positions among the other Archostemata, as e.g. in the analyses by Hörnschemeyer (2009). These results suggest that many characters used in the analyses developed convergently in similar ways in these two species. However, characters of the male genitalia might indicate that contrary to previous assumptions, C. relicta is closely related to Cupedidae and M. debilis a member of Ommatidae, probably closely related to Omma (Hörnschemeyer 2009). An interesting result of the analysis of Hörnschemeyer (2009) is that Tenomerga, as defined by Neboiss (1984) most likely is paraphyletic with the African Tenomerga leucophaea forming a monophyletic grouping together with the North American Cupes capitatus and African/Madagascan Rhipsideigma. Despite of all these analyses the phylogenetic relationships of archostematan beetles are still not satifactorily understood. Especially the positions of M. debilis, C. relicta and the enigmatic Sikhotealinia zhiltzovae Lsafer, 1996 need further investigation. Perhaps an analysis based on genetic data might bring some clarification. The tree represents the relationships of Archostemata as reconstructed by Hörnschemeyer (2009). The tree represents the relationships of Archostemata and early fossil beetles as reconstructed by Beutel et al. (2008). Atkins, M. D. 1963. The Cupedidae of the world. Canadian Entomologist 95: 140-162. Beutel, R. 1997. Phylogenese und Evolution der Coleoptera (Insecta), insbesondere der Adephaga. Abhandlungen des Naturwissenschaftlichen Vereins in Hamburg (NF) 31: 164 pp. Beutel, R. G., Ge, S.-Q. & Hörnschemeyer, T. 2008. 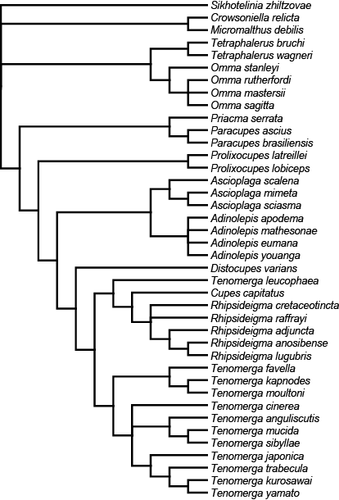 On the head morphology of Tetraphalerus, the phylogeny of Archostemata and the basal branching events in Coleoptera. Cladistics 24: 270-298. Beutel, R. G. & Haas, F. 2000. 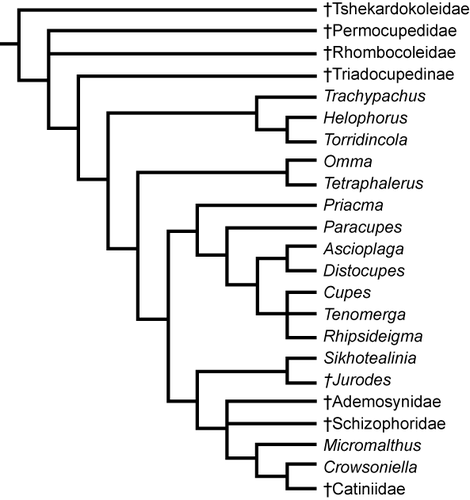 Phylogenetic relationships of the suborders of Coleoptera (Insecta). Cladistics: the international Journal of the Willi Hennig Society 16: 102-141. Beutel, R. G. & Hörnschemeyer, T. 2002a. Larval morphology and systematic position of Micromalthus debilis LeConte, 1878 (Coleoptera, Micromalthidae). Systematic Entomology 27: 169-190. Beutel, R. G. & Hörnschemeyer, T. 2002b. Description of the larva of Rhipsideigma raffrayi (Coleoptera, Archostemata), with phylogenetic and functional implications. European Journal of Entomology 99: 53-66. Böving, A. G. 1929. On the classification of beetles according to larval characters. Bulletin of the Brooklyn Entomological Society 24 (2): 55-80 + Plt. 1-17. Böving, A.G. & Craighead, F.C. 1931. An illustrated synopsis of the principle larval forms of the Coleoptera.. Entomologica Americana (n.s. ), New York 11: 1-351. Carpenter, F. M. 1992. Treatise on Invertebrate Paleontology. Part R. Arthropoda 4, Volume 3: Superclass Hexapoda. Geological Society of America and University of Kansas, Boulder, Colorado and Lawrence, Kansas. Crowson, R.A. 1962. Observations on the beetle family Cupedidae, with descriptions of two new fossil forms and a key to the recent genera.. Annals & Magazine of Natural History 5, ser. 13, No. 51: 147-157. Crowson, R.A. 1975. The evolutionary history of Coleoptera, as documented by fossil and comparitive evidence. Atti del X CongressoNazionale di Entomologia. Sassari, Italia, 20-25 Maggio 1974: 47-90. Crowson, R.A. 1981. The biology of Coleoptera. Academic Press, London : 802 pp..
Friedrich, F., Farell, B.D., Beutel, R.G., 2009. The thoracic morphology of Archostemata and the relationships of the extant suborders of Coleoptera (Hexapoda). Cladistics 25: 1-37. Ge, S.-Q., Hörnschemeyer, T., Friedrich, F. & Beutel. R. G. 2011. Is Crowsoniella relicta really a cucujiform beetle? Systematic Entomology 36: 175–179. DOI 10.1111/j.1365-3113.2010.00552.x. Gersdorf, E. 1976. Dritter Beitrag über Käfer (Coleoptera) aus dem Jungtertiär von Willershausen, Bl. Northeim 4226. Geologisches Jahrbuch A 36: 103-145. Grebennikov, V.V., 2004. Review of larval morphology of the beetle suborder Archostemata (Insecta: Coleoptera), including first-instar chaetotaxy. European Journal of Entomology 101: 273-292. Hörnschemeyer, T., 2005. Archostemata Kolbe, 1908. In Kristensen, N.P., Beutel, R.G. (eds. ), Beutel, R.G., Leschen, R.A.B. (Vol. Eds. ), Coleoptera, Vol. I. Morphology and Systematics (Archostemata, Adephaga, Myxophaga, Polyphaga partim). Handbook of Zoology Vol. IV, Arthropoda: Insecta. De Gruyter, Berlin, New York, pp. 157-182. Hörnschemeyer, T., 2009. The species-level phylogeny of archostematan beetles - where do Micromalthus debilis and Crowsoniella relicta belong? Systematic Entomology 34(3): 533-558. Hörnschemeyer, T., Tröster, G. & Wedmann, S. 1995. Die eozänen Käferfaunen des Geiseltales und der Grube Messel ein Vergleich unter systematischen und paläoökologischen Gesichtspunkten. Hallesches Jahrbuch für Geowissenschaften Reihe B: Geologie, Paläontologie, Mineralogie 17: 107-119. Kirejtshuk, A.G. 1999. Sikhotealinia zhiltzovae (Lafer, 1996) Recent representative of the Jurassic coleopterous fauna (Coleoptera, Archostemata, Jurodidae). Proceedings of the Zoological Institute / Russian Academy of Science 281: 21-26. Kirejtshuk, A.G., Nel, A. & Collomb, F.-M. 2010. New Archostemata (Insecta: Coleoptera) from the French Paleocene and Early Eocene, with a note on the composition of the suborder. Annales de la Société Entomologique de France, (n.s. ), 46, 216–227. Kolbe, H. 1908. Mein System der Coleopteren. Zeitschrift für wissenschaftliche Insekten-Biologie 4: 116-123, 153-162, 219-226, 246-251, 286-294, 389-400. Lafer, G. S. 1996. Fam. Sikhotealiniidae. In: P. A. Ler (ed.) Key to the insects of the Russian Far East, Dal'nauka, Vladivostok Vol. III, Part 3: 390-396. Lawrence, J. F. 1991. Ommatidae (Archostemata), Cupedidae (Archostemata), Micromalthidae (Archostemata). In: Stehr: Immature Insects Vol. 2: 298-302. Lawrence, J. F. 1999. The Australian Ommatidae (Coleoptera: Archostemata. new species, larva and discussion of relationships. Invertebrate Taxonomy 13: 369-390. Lawrence, J. F. & Newton, A. F. 1995. Families and subfamilies of Coleoptera. In: Pakaluk & Slipinski: Biology, Phylogeny, and Classification of Coleoptera. Vol. 2. Muzeum i Instytut Zoologii PAN, Warzawa: 779-1006. Lawrence, J.F. 1982. Coleoptera. Pp. 482-553 in Parker, S. P. (ed.) Synopsis and Classification of Living Organisms. McGraw-Hill, New York. Monros, F. & Monros, M.M. de 1952. Las Especies Argentinas de Cupedidae (Coleoptera). Anales de la Sociedad Cientifica Argentina 154: 19-41. Neboiss, A. 1984. Reclassification of Cupes Fabricius (s.lat. ), with descriptions of new genera and species (Cupedidae: Coleoptera). Systematic Entomology 9: 443-477. Peyerimhoff, P. de 1909. Le Cupes de l'ambre de al Baltique. Bulletin de la societe entomologique de France 3: 57-60. Pollock, D. A. & Normak, B. B. 2002. The life cycle of Micromalthus debilis LeConte (Coleoptera: Archostemata: Micromalthidae): historical review and evolutionary perspective. Journal of Zoological Systematics and Evolutionary Research 40 (2): 105-112. Ponomarenko, A. G. 1969. Historical development of the Coleoptera-Archostemata. Trudy paleontologicheskogo instituta akademii nauk SSSR 125:1-240. Ponomarenko, A. G. 1997. New beetles of the Family Cupedidae from the Mesozoic of Mongolia. Ommatini, Mesocupedini, Priacmini. Paleontological Journal 31(4):389-399. Tan J. & Ren D. 2009. Mesozoic Archostematan Fauna from China. Science Press, Beijing 347 p.
A Wild Beetle Chase. A short film about the work of coleopterist Michael Ivie. Classification of Fossil Beetles. A. G. Ponomarenko and A. G. Kirejtshuk, Zoological Institute of the Russian Academy of Sciences. Page: Tree of Life Archostemata. Authored by Thomas Hörnschemeyer. The TEXT of this page is licensed under the Creative Commons Attribution-NonCommercial License - Version 3.0. Note that images and other media featured on this page are each governed by their own license, and they may or may not be available for reuse. Click on an image or a media link to access the media data window, which provides the relevant licensing information. For the general terms and conditions of ToL material reuse and redistribution, please see the Tree of Life Copyright Policies.